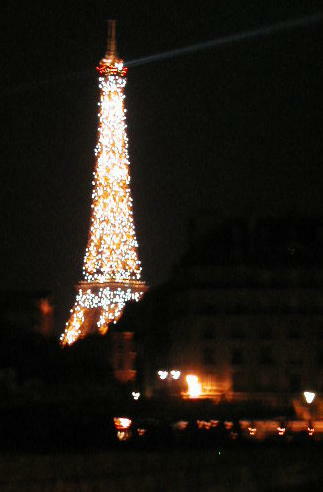 The Eiffel Tower glittering at night, as seen from the Esplanade des Invalides. 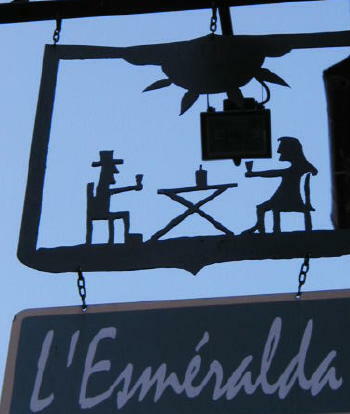 Sign for a cafe on rue Violet. 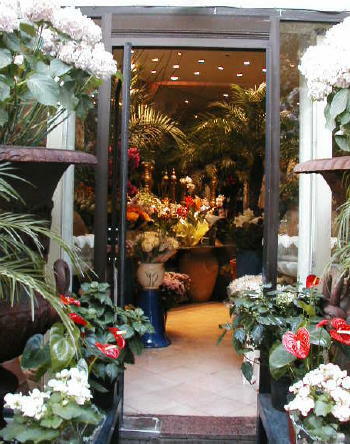 At right, a nearby florist shop. The Tour de France has been occupying some of our time lately. The fans during the first half of last Saturday's time trials were crazy. They were getting in the way of the racers, causing all kinds of havoc. A few of them even spat on McEwen, Armstrong, and one of the Germans (Kloden or Ullrich?). The authorities responsible for the area that was the site of the second half of the time trials were much more together. They had barricades set up, and the crowd stayed behind them. One of the newspapers said that too much drinking out in the hot sun was the reason for the bad behavior. Hmmmm. On Thursday, we went to Cafe Metropole and met Rick, Lucky, Kathy and Diane. Rick had lots of questions about the place where we live. Until occasions like this arise, I lose sight of how truly unusual Sanibel is. Alligators in your back yard? No mall? No traffic lights? Former CIA agents helped to organize the city? Huge cockroaches called palmetto bugs? Lots of butterflies? Large water birds fishing in your back yard? No high rises on the beach? Lots of undeveloped land? You can see the Milky Way at night? Yes, we live in a strange and wonderful place. Tom's health problem seems to have disappeared as mysteriously as it appeared. We've actually been working lately -- doing research for the new textbook. We walk in the late afternoons and evenings. I discovered a new foie gras shop in the neighborhood, on Lourmel. The owner was very friendly. He used to work for Nabisco in Europe, so he was not about to let me speak French. He wanted to use his English. (More and more people are like that now in Paris.) I love the foie gras I bought in this shop. I only have to eat a little bit of it, and I'm satisfied for practically the entire day. I'm sure my nutritionist friend Carole would not approve of the foie gras diet, however. Also on Lourmel is a new restaurant that we like -- the Chevreau. Good food, great prices. Two of our all time favorites, Oh! Duo and L'Épopee, have raised their prices. That, in combination with the weak dollar, makes them now very expensive. One of the newspapers quoted a tourism expert as saying that the realtors who raised rent on seasonal houses in Provence made a huge blunder, pricing themselves out of business. I hope that doesn't happen to our favorite restaurants.